I have been blogging for a month about screenings at the Paley Center for Media‘s festival Judy Garland: The Television Years (July 20-August 18, 2011) and films shown at the Film Society of Lincoln Center‘s festival Judy Garland: All Singin’, All Dancin’, All Judy! (July 26-August 9, 2011). The challenge of summing up the experience has stymied me — so different from indulging in closely observing and responding to individual festival programs. But help has arrived. A piece appears in the Sunday August 21, 2011 New York Times about charismatic opera and other classical music performers to provide some summary concepts. “A Gift From the Musical Gods”, by Zachary Woolfe (full article published online August 17, 2011) gives me some tools to step outside of my recent Garland immersion to consider a few themes. From a remove. The fact that this author begins his ruminations on the subject of “charisma” considering the audience response to Maria Callas, one performer I have discussed often parallel to Garland’s appeal to fans and type of artistry, I contend is not a coincidence. 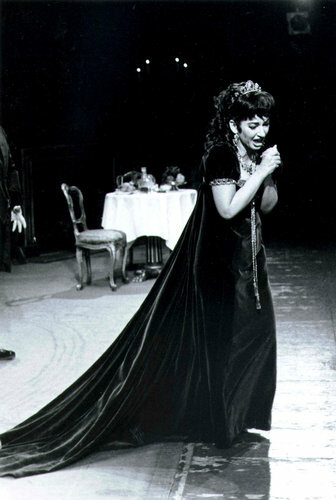 Maria Callas in Tosca at the Metropolitan Opera March 19, 1965. Photo: Louis Mlanon. Judy Garland at Carnegie Hall. April 23, 1961. Many Garland fans like myself enjoy a wide range of musical talents that offer a context for her particular voice and her power. We are eclectic, yet that range and depth of knowledge constantly entertains and circles back to what is similar to, different from, or somehow suggested by Garland’s work. 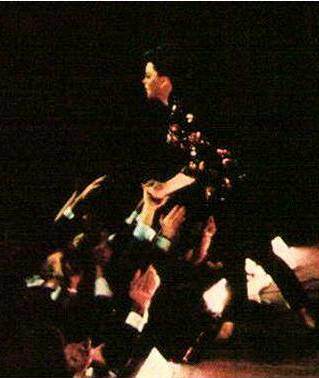 An online music sharing group rooted in celebrating the vocal art of Garland called The Judy Garland Experience plays with this idea often, posting entire concerts by Garland, for example, and also the work of people who worked with her or who played the same venues she played, or who provide other kinds of context. As I have reflected here, the film and television retrospective offerings dating back to Frances Gumm at age 7 performing with her sisters show us the little girl who later changed her name to Judy Garland had “it” at seven. Woolfe reflects on the fact that you have it or you don’t. Ms. Millo responds to Woolfe’s query with the same bullfighting analogy. The book will never be closed on Garland’s talent because it is current, fresh and living. New fans encounter her, established fans continue to enjoy her, and everyone can learn new things when performances are presented anew, in a new format, with a fresh perspective. The charisma, the joy, the wisdom, the humor, the genius, and the truth of the legacy. Terrific! Enjoyed it very much!